PRESS RELEASE: Castries, St Lucia (July 20th , 2018) – The Soca Awards Organization has designated July 10th 2018 as the main event day of its 15th annual International Soca Awards, under the theme: Taking Soca to Higher Heights –“A Soca Vacation”. 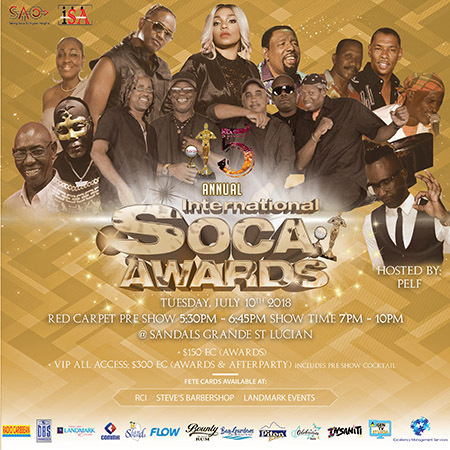 The Awards ceremony, which will commence with a pre red-carpet affair on the night of July 10th will honor 5 of the region’s most notable figures in the Soca music fraternity, The Explainer, Destra Garcia, Edwin Yearwood, Invader, & WCK. The 2018 Inaugural St Lucian Staging will be preceded by a number of activities to include the official Welcome party at the popular Coconutz Restaurant & Entertainment Yard in Rodney Bay featuring entertainment from the nominees for International Soca Dj’s of the Year to include Private Ryan (TnT) International Stephen (St Lucia) Dr. Jay (Toronto) DJ Levi Chin (St. Lucia) DJ Spice (NY) and Back 2 Basic from New York. The spectacular awards show, which will reveal the public choice recipients after several weeks of voting, is poised and ready to go according to SAO, Chief Executive Collin Jackman. The event is expected to take flight at Sandal’s St Lucian Grande. Jackman speaking from the Awards shop in FT Lauderdale Florida, via video revealed that the awards were all prepared and ready for shipment into St Lucia, for what many have dubbed as the most celebrated event to ever take place in recent times in the St Lucian entertainment Industry. Planned activities include a highly anticipated Awards after party, pegged with over four (4) hours of high energy yielding mainstage activity to feature performances by Homegrown, Regional and International Band’s & Artiste, as well as International Host & Dj’s dubbed as “Saka Fete” which will set the pace into the Inaugural staging of the awards billed to be stationed in St Lucia for a period of 3 Years. Initiated in 2003 by young Trinidadian Entrepreneur Collin Jackman, the Soca Awards has served to develop, promote, and preserve the cultural significance of Soca Music to our heritage as a people while also promoting; a support the Artiste and Music agenda. “We are just ecstatic to bring another creative venture to our community”, says Jackman. “This year’s Awards will, like other of the SAO’S initiatives, benefit the National community & economy.